'The Wolf and the Shield' -- What Does Your Heart Hunt For? 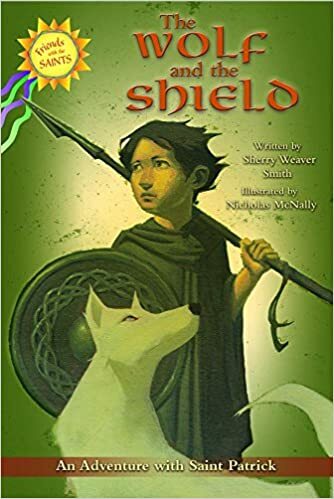 “The Wolf and the Shield” is a masterfully crafted tale. In the beginning, we meet Kieran, an 11-year-old boy burdened with a philosophical quandary on the brink of his maturity. In the wake of his father’s death, it falls to him to provide for his family, and the seeming means to do so arrives in the form of a tempting offer to join his clan chieftain’s ranks as a warrior, assigned to protect and defend the clan, albeit it by dubious means. It is a den of predatory wolves that holds the biggest threat to this particular region of agrarian northern Ireland. When Kieran sets out to prove his worthiness in his own wolf hunt, he meets Saint Patrick, in a forest, who poses the question, “What does your heart hunt for?” and guides him to a clearing, where an orphaned wolf pup awaits, to which Kieran quickly becomes attached. I can visualize you reading this book to your cherished grandchildren! It matters not their age, only the spirit of the act and the gift of your voice. Fran, as the author, I would be honored if your grandchild would have the chance to read it. I have a 12-year-old daughter, and I originally wrote it for her. It is so touching to hear that it may reach other children.